Highly effective dewomer that eliminates the tissue stages of heartworm larvae and removes adult roundworms and hookworms from dogs. Made with real beef and is a chewy treat for dogs. Heartgard Plus heartworm treatment eliminates the tissue stages of heartworm larvae (Dirofilaria immitis) and removes adult roundworms (Toxocara canis, Toxascaris leonina) and hookworms (Ancylostoma caninum, A. braziliense, Uncinaria stenocephala) from dogs. Heartgard will control heartworm infections acquired in the previous 4 months provided that monthly treatment is continued for at least 12 consecutive months. Give one Heartgard Plus chew each month, preferably on the same day or date. The Heartgard Plus cube may be offered by hand or added to the food. Dogs should be closely observed for several minutes following administration to make sure that the entire dose has been consumed. Store below 30 deg. C (room temperature). Do not freeze. Protect from light. We may be new to Pet Shed but the first time we ordered this product back in 2016 gave us a new favorite Pet Store. Aside from their customer service who are very accommodating and lovely. Pet Shed made us realized that we can keep our pets from harm without spending a whole lot of money. Pet Shed is not just doing business but they're helping customer and our pets at the same time. We love you all! I trust this product 100%. My wife and I started taking care of a stray dog that was heart worm positive and the vet told us we could do the risky treatment that could possibly kill our new dog or we could do a long term treatment (HeartGard). we have been giving HeartGard to our dog for about 11 months now and there has been a huge improvement. Our dog no longer is wheasing or out of breath and she has tones of energy now and wants to play ALL THE TIME! 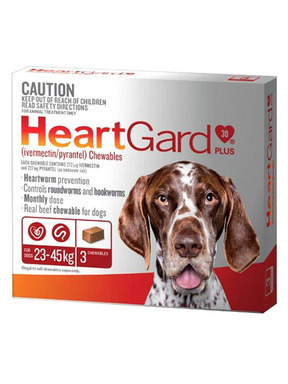 This Heargard medicine is so easy to administer and gives me peace of mind knowing my dog is protected. Super price and shipping! I've been using a much more expensive medication from my vet, and my dogs had to be bribed to take it. It was a whole ordeal, and my littlest one always had an upset stomach for a day or two following. This, however, seems like a treat to them! No upset tummies and much easier for them to take! And did I mention it is less expensive? Excellent - HeartGard for cheaper! So grateful for PetShed! Heartgard is much cheaper than other pet websites and I don't need to pay for a heartworm test every time I get more. I have five dogs, and they all stay on heartworm preventative monthly, so saving money on a test AND the product is definitely helpful to me. The packaging is the same as the US, with of course the weight difference (pounds vs kilograms). Highly recommend this company. I have ordered Heartgard for my dog from Petshed for several years. It is the best price I have found. I have had no issues with the product and costumer service was very helpful when I had a question. Will continue to order from Petshed. I have purchased Heartgard for my dog from Petshed for several years. I have found it to be a great price through Petshed. Have had no issues with the product and costumer service was helpful when I had a question. I tried "generic" before and ended up with hard pills my dog would spit out. If this is generic Heartguard, neither my dog nor I can tell! Soft chewables that actually seem bigger and softer than actual Heartguard. The shipping takes a little longer but well worth it for the great prices. Since we are in animal rescue having this less expensive preventative for our fosters is simply amazing. It truly helps us help more animals in need. We thank you!